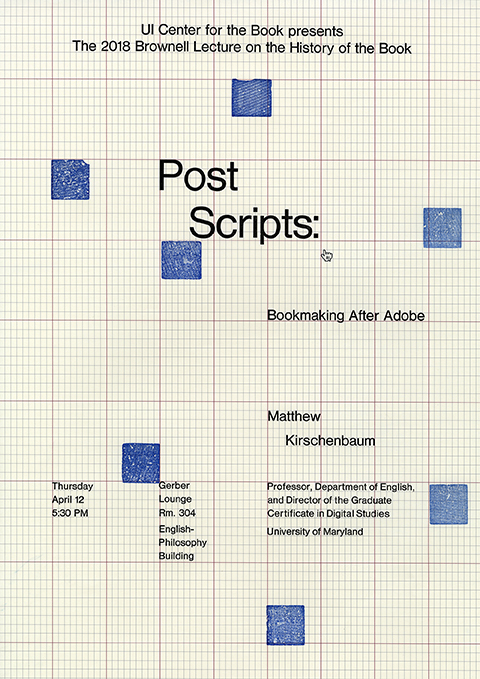 Matthew Kirschenbaum is Professor in the Department of English at the University of Maryland and Director of the Graduate Certificate in Digital Studies. He is also an affiliated faculty member with the College of Information Studies at Maryland, and a member of the teaching faculty at the University of Virginia’s Rare Book School. His most recent book, Track Changes: A Literary History of Word Processing, was published by Harvard University Press’s Belknap Press in 2016; with Pat Harrigan, he also co-edited the collection Zones of Control: Perspectives on Wargaming from the MIT Press (2016). His public-facing writing has appeared in the Chronicle of Higher Education, Slate, LA Review of Books, Paris Review Daily, War on the Rocks, The Conversation, and Public Books. His research has been covered by the New York Times, The Atlantic, The New Republic, The Guardian, National Public Radio, Boing Boing, and WIRED, among many other outlets. In 2016 he delivered the A.S.W. Rosenbach Lectures in Bibliography, a written version of which are under contract to the University of Pennsylvania Press as Bitstreams: The Future of Digital Literary Heritage. His first book, Mechanisms: New Media and the Forensic Imagination (MIT Press, 2008) won multiple prizes, including the 16th annual Prize for a First Book from the Modern Language Association. He was also the lead author on the Council on Library and Information Resources report Digital Forensics and Born-Digital Content for Cultural Heritage Collections (2010), recognized with a commendation from the Society of American Archivists. He has been a Guggenheim and an NEH Fellow.